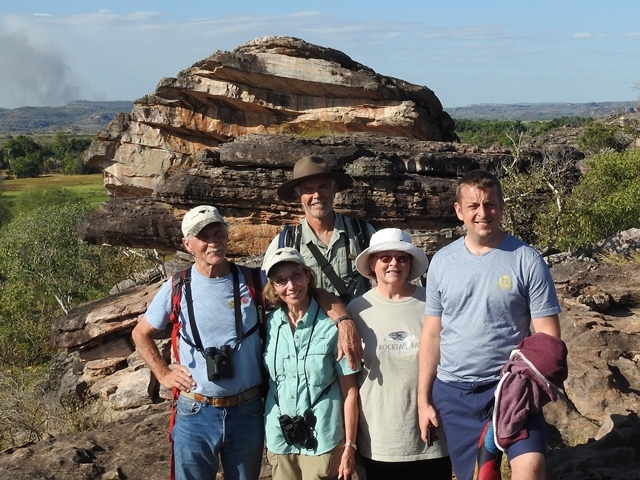 Guide Mike Jarvis, Guests Trevor and Lynne Rackstraw from the UK, Andrew and Anna Knowlson and Neil McKinlay and Pam Hazelwood from NSW. Bush breakfast at Dudley Point. Great day with Rainbow Pitta, Bush and Beach Stone-curlew at East Point. Red-headed Honeyeater at Rapid Creek. Picnic lunch at Rapid Creek. 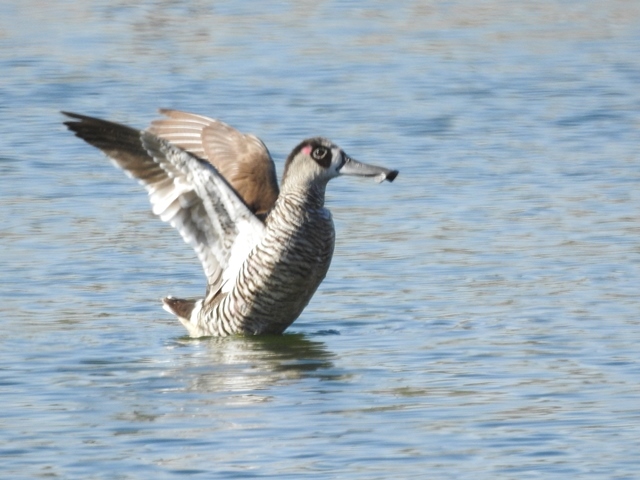 Pink-eared Duck and Red-kneed Dotterel at Pine Creek STP. 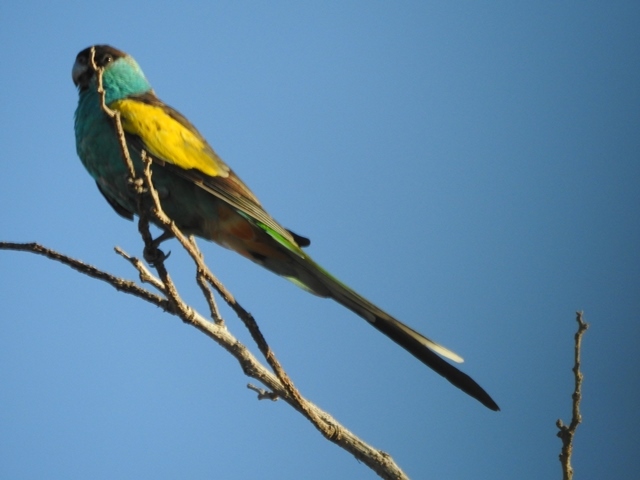 About 50 Hooded Parrots flying over at Pine Creek plus great close-up views. Dinner and bird call at Railway Resort, 82 species seen. 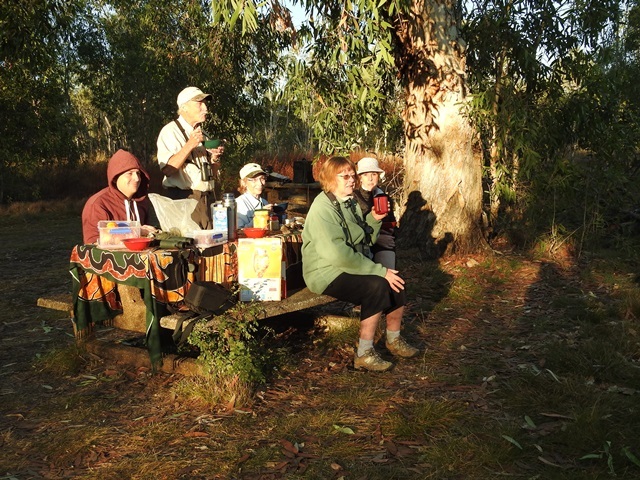 Bush breakfast at Fergusson River. Not many Gouldians but those we saw were brilliantly coloured mature Red and Black-headed male and female. Amazing volume and intensity of birds. We had great views of Yellow-rumped Mannikins in a flock of about forty with some Purple-crowned Fairy wrens at Victoria River Roadhouse. Dinner accommodation and bird call at Victoria River Roadhouse, 58 species seen. 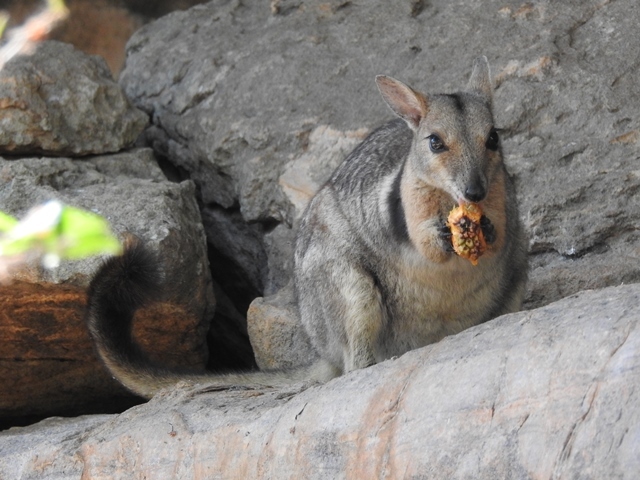 Bush breakfast at Escarpment lookout carpark. White-browed Woodswallows at Escarpment Lookout. Great view of Blue-winged Kookaburra in lovely light. Lunch and dinner at Policeman’s Point. 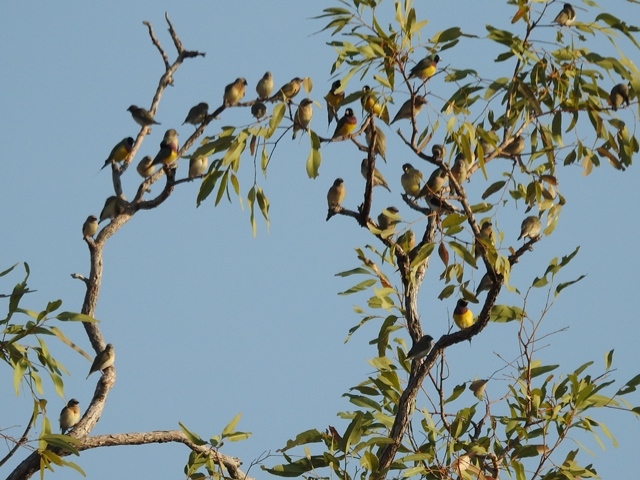 Gouldian Finches showed up on Escarpment Lookout location while we were looking for Grey-fronted Honeyeater. Cockatiels and Red-backed Kingfisher at the airfield. Two Black-necked Storks at Policeman’s Point. Accommodation at Wirib. Dinner and bird call at Policeman’s Point, 50 species seen. Be glad of the fortunate vowel! Dinner and bird call at the Pine Tree Hotel. 50 species seen. 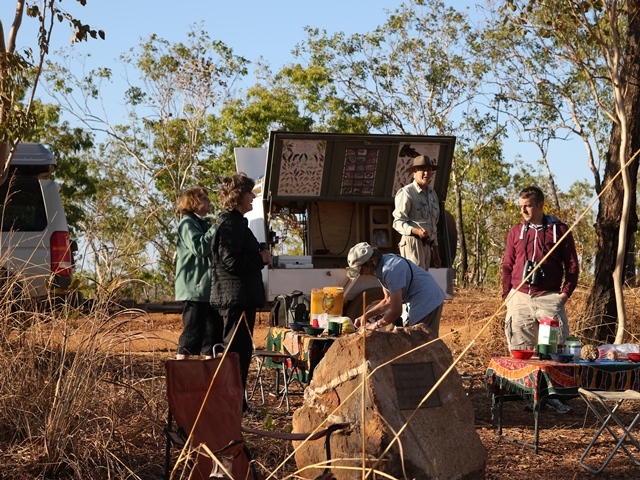 Bush breakfast at Edith Falls road. Many Gouldians and other finches came to drink. Red-winged Parrots and Black-necked Stork. Nesting White-breasted Woodswallows at Pine Creek. Lunch at Harriot Creek, Pheasant Coucals, Brown Goshawk and Silver-backed Butcherbirds were seen. We continued on to the Warradjan Centre, looked at the display, and had ice-creams. Then we joined the 4.30 Yellow Water Cruise, highlights were Black Bittern, Azure Kingfisher, Glossy Ibis and Comb-crested Jacana. Dinner and bird call at Aurora and accommodation at Anbinik. 82 species seen. Bush breakfast at Anbangbang, About six Partridge Pigeons were on the road and in the grass on the way to Burrunggui. Rock Art and Rainbow Pitta on the circuit walk around the rock. Lunch at Jabiru Lake. Rainbow Pitta at Burrungui. 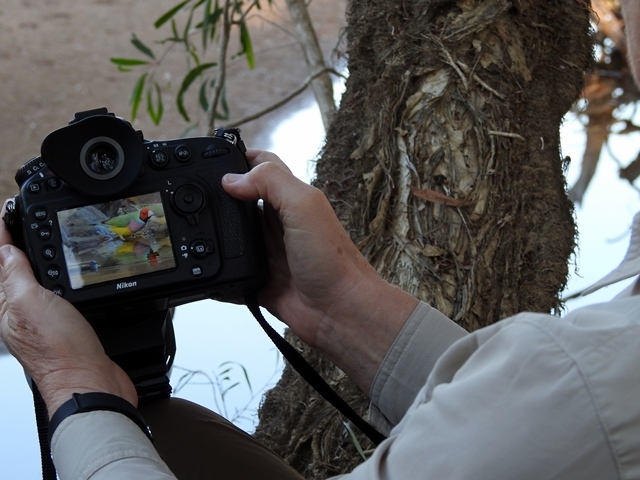 Several Chestnut-quilled Rock-Pigeons at Ubirr and a Rainbow Pitta at Manngarre. Dinner and bird call at Aurora. 60 species seen. Bush breakfast at Mamukala, Bar-Breasted Honeyeaters and Red-backed Fairy-wrens were sighted. 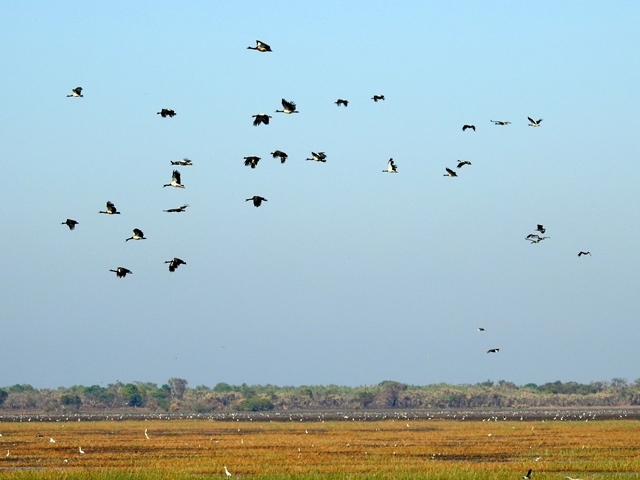 Views out over the wetland revealed thousands of birds and was a breathtaking sight. 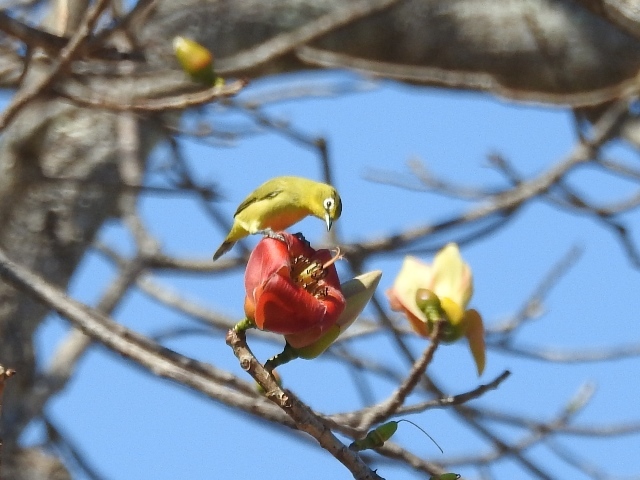 We stopped at South Alligator River where we saw the Canary White-eye and broadbilled flycatcher. 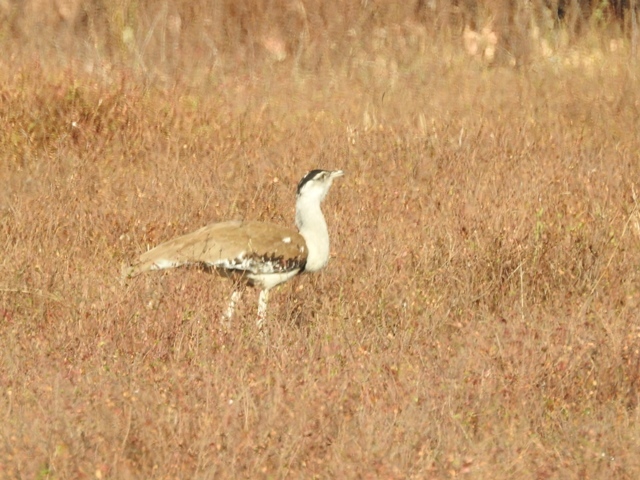 More Australian Bustards were sighted as we turned off the main road. Lunch was at the Bark Hut where we sighted an emu at last. Unfortunately it was a captive! 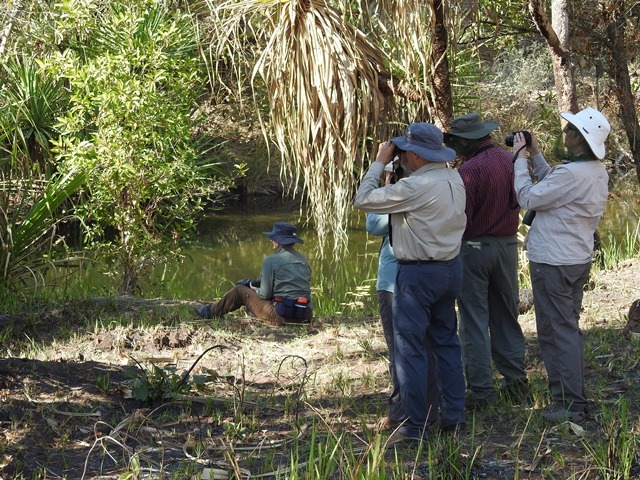 Then on to Mary River, where some went on a river cruise and saw a Great-billed Heron. Others went walking and saw a white morph Grey Goshawk and a dead Cane Toad. Dinner and bird call was enjoyed at the Mary River Wilderness Retreat restaurant. 86 species seen. 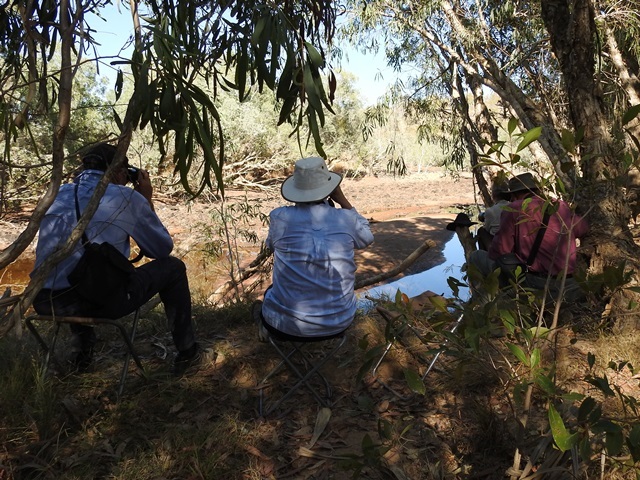 Our last bush breakfast was on the Marrakai track, and we had about 100 Gouldians join us, plus a brief showing of Northern Rosellas. Our main target for the Marrakai was the Blacktailed Treecreeper, which we heard at breakfast but didn’t see. Searched up and down, saw Buff-sided Robin at Margaret River but still no treecreeper. We stopped and took photos of a Spotted Harrier not far from the Arnhem Highway T-junction, and then had great views of Black-tailed Treecreeper! Lunch was at Corroboree Park and then we continued on to Fogg Dam. Here we had several Australian Pratincoles and 1000’s of Pied Heron, as well as nearly every other water bird. We spent about an hour at Charles Darwin National Park, saw Varied Lorikeets and Red-headed Honeyeaters. Return to Palm City Resort. 83 species seen. 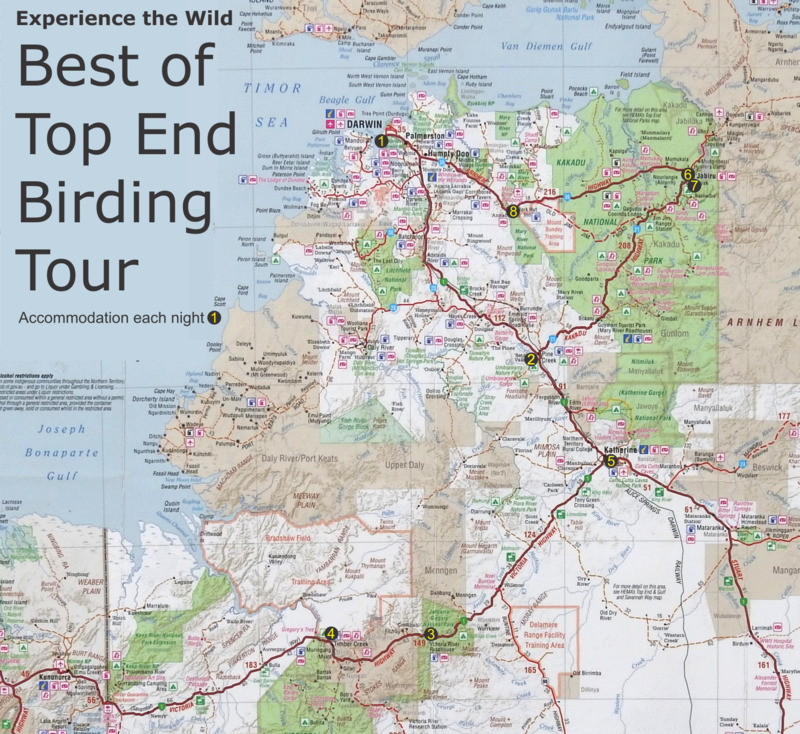 Total of 155 bird species for the trip. Eastern Reef Egret Egretta sacra East Point Grey and White morphs. 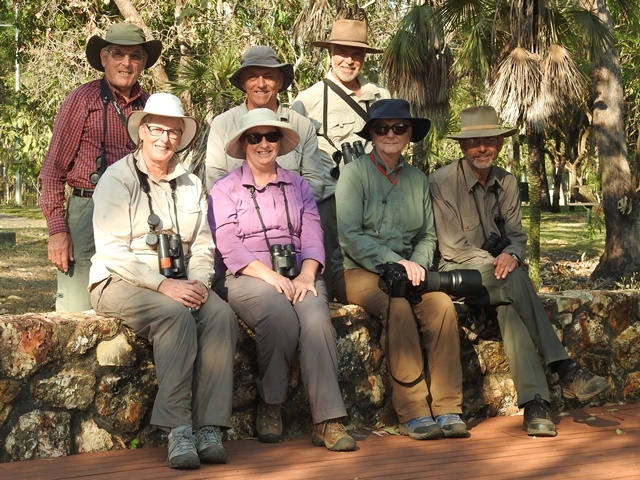 Kakadu Nature's Way tour July 20-24. Guests Mike and Nancy from the US, Mike and Helen from the UK and Maggie from Tasmania. Meet and greet at the Seafood on Cullen Bay on Sunday night. 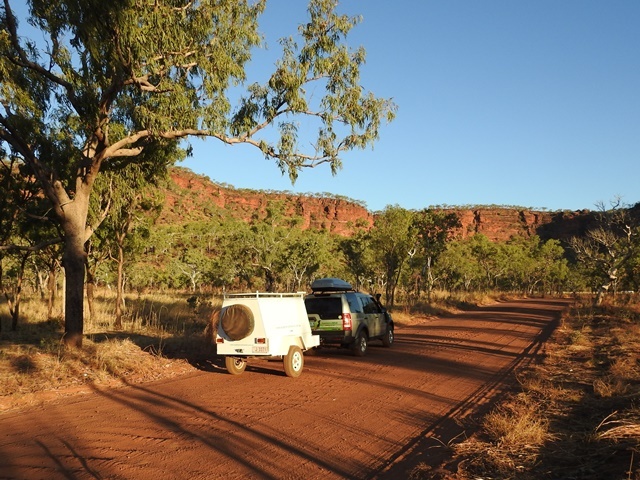 6am pick up from Darwin and bush breakfast on the Marrakai track. 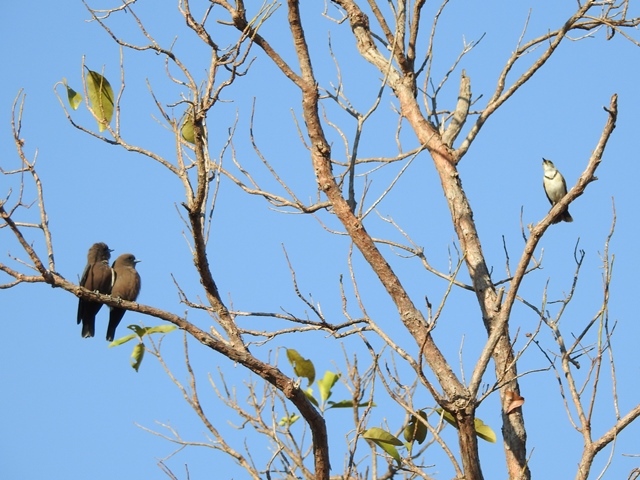 Black-tailed Treecreepers, Little Woodswallows and Red-winged Parrots. 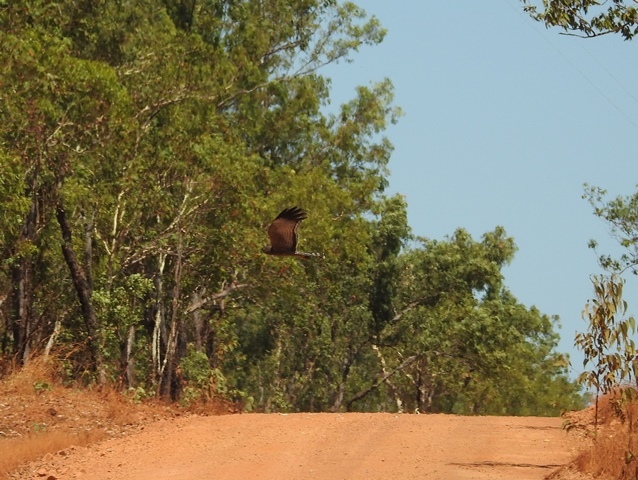 Raptors on the floddplain included Nankeen Kestrel, three Wedge-tailed Eagles and a Little Eagle. later we had great views of a Spotted Harrier. Quite a variety of birds at the lunch spot on the Margaret River. We continued on to the Mary river Wilderness Retreat and did the Bamboo Walk. 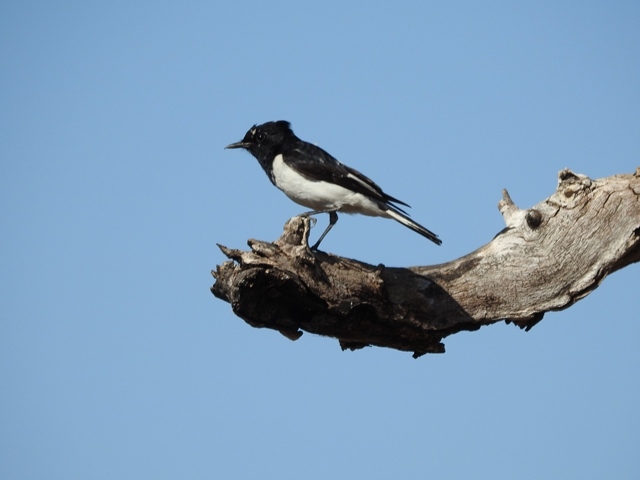 Here we saw Arafura Fantail and many other species. Dinner at the resort restaurant. Bush breakfast at Mamukala. Grey-crowned Babblers building a nest neart the carpark. Blue-faced Honeyeater chasing off a Torresian Crow. Then we did the loop walk down to the wetlands and saw a fully coloured Red-backed Fairywren, Sacred and Forest Kingfishers, Masked, Long-tailed, Crimson and Double-barred Finches. At the hide several Comb-crested Jacanas had chicks. We then went to Ubirr and had a picnic lunch near Manngarre. Rose-crowned Fruit-Doves chased each other amorously through the folaige of the ficus next to the picnic. On the Manngarre walk we saw large Estuarine Crocodiles jostling with each other for position with the incoming tide. We viewed the rock art at Ubirr and then went to the Bardedjildji Sandstone Walk. Found a Chestnut-quilled Rock -Pigeon at the last leg of the walk. Returned to Jabiru and had dinner at Aurora. Bush breakfast at Anbangbang, light was magic, great for photography, water birds were there in good numbers and variety. From there we went to Burrunggui and did the circuit walk. Heard White-lined Honeyeater but didn't see it. We had good views Sandstone Helmeted Friarbird and Red-winged Parrot. 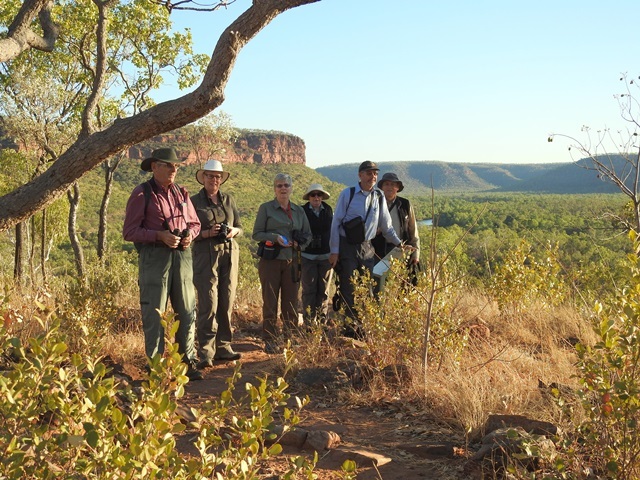 Rock art, habitation areas and natural features were enjoyed by all. Picnic lunch at Mardugal, great views of Blue-winged Kookaburra and Northern Fantail. From there we went to the Waradjan Cultural centre and spent some time learning more about Aboriginal culture and history of the area and checked out the souvenir shop as well. We joined the 4.30pm sunset cruise on Yellow Water. Saw biggest mobs of birds, many crocs including Max the boss. Black-necked Stork, Nankeen Night Heron and great, close-up views of an Azure Kingfisher. There were alot of Comb-crested Jacanas including one with very small chicks. White-breasted Sea-eagles were on teh nest. Saw a Swamp Harrier. Bush breakfast at the South Alligator River. We walked along the river, observed flood debris 9-10 metres up some trees, saw numerous animal tracks. Galahs, Forest Kingfisher pair, Green Oriole family, male Mistlebird. Had a coffee break at Harriot Creek and saw Red-collared Lorikeets (at nest hollow) and Silver-backed Butcherbird. Lunch at Copperfield Dam, Cockatiels flying in for a quick drink drink, Galahs, interesting behavior as pair fed in the long grass and flew up to a nearby branch and commenced allopreening. Black Kite waded into the water and bathed. Nymphoides indica (lily) growing on the water's edge. At the Edith Fall's Road site we saw juvenile and female Gouldians, Masked, Long-tailed, Double-barred and Crimson Finches. 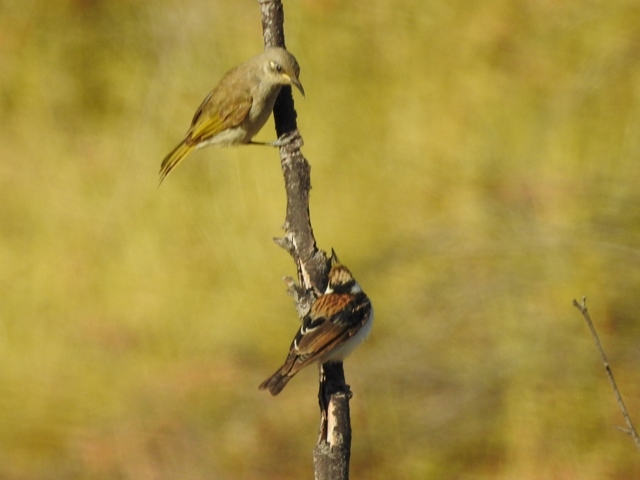 Paperbark Flycatcher and Rainbow Bee-eaters. There were several Archer Fish. 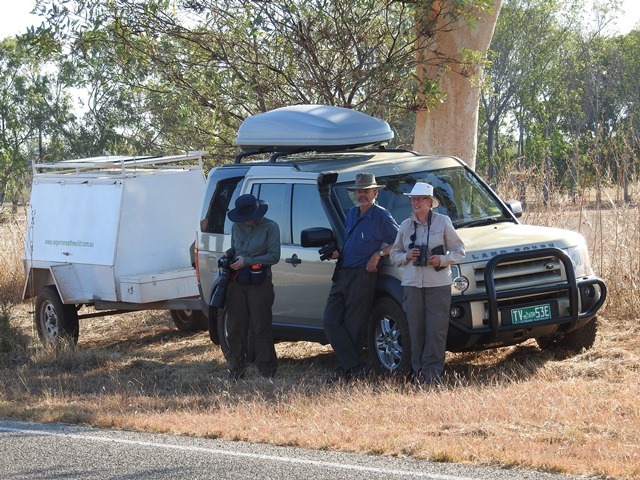 At Pine Creek we saw Grey-crowned Babblers, Blue-faced Honeyeaters, Little Friarbirds, Crested Pigeon and Hooded Parrots. Checked in at the Pine Creek Hotel and had dinner at the Lazy Lizard. Breakfast at Fergusson River with Gouldian's coming down to drink intermittently from about 8am on. Eventually a male Red-headed Gouldian showed as well as Northern Rosella and many other species. We returned to Pine Creek to check out and watched the Great Bowerbird put on a performance near his bower in the campground. We had lunch at a disused dam just off Stuart Highway and watched a Royal and a Yellow-billed Spoonbill work the edges of the dam together. From there we went to Fogg Dam, saw and photographed a good many waterbirds from the vehicle as we slowly made our way between the floodplain and the dam. We did about half of the monsoon forest walk in the hopes of seeing a Rainbow Pitta until Nancy spotted one! We watched it for about ten minutes until it disappeared from view. We had a brief stop at the magnetic termite mounds at Lampbell’s Lagoon and returned to Darwin. 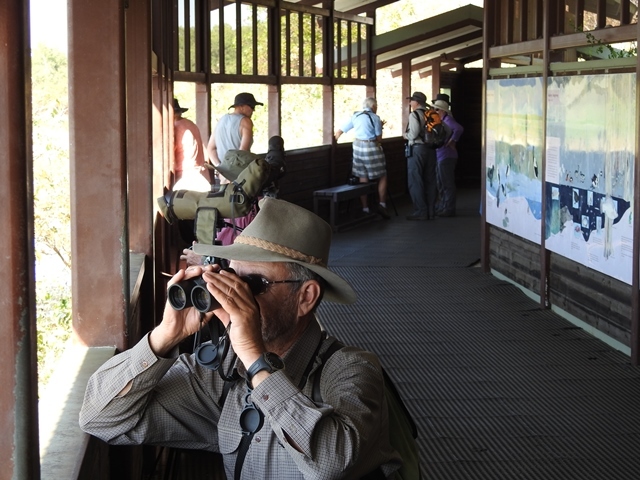 Total of 107 bird species seen.